The "dark matter" refers to this mysterious hidden mass that rules the Universe's gravity, and this term is a general name to store our ignorance on the subject, much like "terra incognita" was on the early maps. Anyway, by combining numerical models and radio observations of some galaxies in the Hydra constellations, a friendly team of scientists managed to clear two tasks that would make me feel a hero if I was one of them. First, they pointed out exactly where the dark matter should be (in red in the picture), so that it becomes suddenly brighter than expected. Then they might have a serious idea about its composition : molecular hydrogen ! 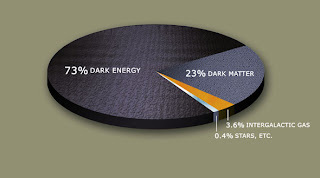 The "hidden" behavior of the dark matter was generally assumed to be due to its exotic composition : nice particles such as neutralinos, axions, or unknown "stuff". 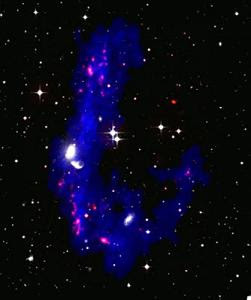 Well in the studied galaxies, assuming that dark matter would be of this type would go against our best modern models about galaxy formation. these models tell that the dark matter should remain in the spherical halos that surround galaxies. But the numerical computations performed on the tide dwarves (forget about your Tolkien dreams, these are galaxies born because of giant intergalactic collisions - a bit freakier than the Moria), show that these galaxies simply stole matter from the discs of their mother-galaxy at their birth. The dark matter in those is obvious : their mass is 3 times what it should be, and it is also obviously not coming from the halos.